This 13 page tutorial will take you step-by-step through the process of making one of these beautiful lampwork dahlia beads using over 40 clear colour photographs detailing each stage. The finished bead is approximately 15mm in diameter with a 2mm diameter central hole. 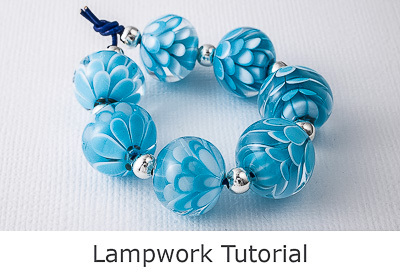 This tutorial is suitable for intermediate and experienced lampworkers and should take approximately 10 minutes to make each bead.